Re. 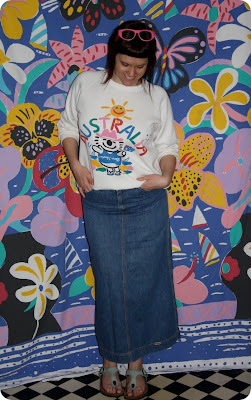 outfit: nothing says 'Slacker Sunday' quite like a sloppy jumper paired with a 1980s long denim skirt... And technically I'm not being a slacker - I'm hoping this is my last weekend on my thesis! *Shucks* - check out this great press I received today in Melbourne's Sunday Age. Oh, and just to clarify: I'm nowhere near 365 outfits... 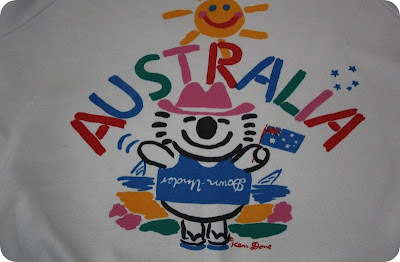 I still need your help with finding, lending and/or donating KD fashion, please! 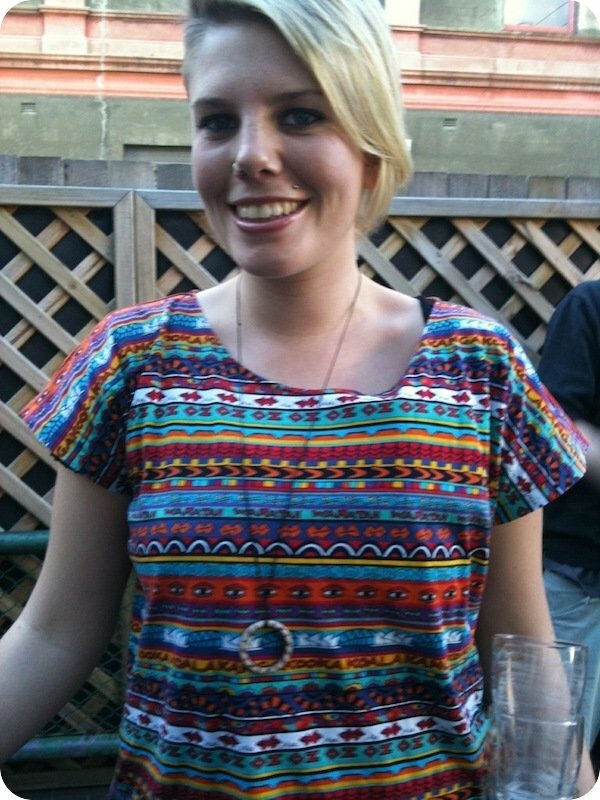 Speaking of *good fashion* - here is the lovely Corrine spotted and photographed by my mate, Iain. Corrine is in a Jenny Kee Tee... can't get much better than that for a sunny day! Well Done, Corrine! And thanks Iain for your Kee-n eyes! Great Press from Melbourne Sunday Age! Congratulations. Yay... so random! 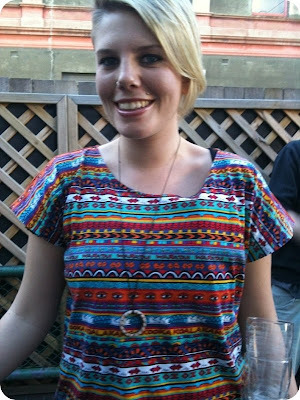 I am a friend of Corrine's and I commented on her top when I saw her at the pub when she was wearing this yesterday! You are beautiful. You can come up to me in a pub anytime you like. Anon - I hope you have passed the blog details onto Corrine, I am sure she will love seeing herself here! Hey thanks for all the lovely well wishes! Foxy look today miss. Sloppy Joe and long denim skirt. Smoking!